Super Grip for Glass Shelf, 1-1/4" x 1"
Ticket Holder, for Glass Shelf, 2" x 7/8"
UPC Holder, for Wire Shelf, 5" x 1-1/4"
Wire Holder, for Wire Shelf, 2 1/2"
Price Channel Label Holder, for Wire Shelf, 2" x 1-1/4"
Basket Label Holder, for Wire Shelf, 3" x 1-1/4"
Add these sign or label holders onto any wire design shelf, bin, tray, or basket. Some are specially designed for glass shelves because glass is slippery and requires more grip. Labels are sold separately as these are just the acrylic holders. Each sign holder is unique because each of them are different sizes and one is not the same as the other. 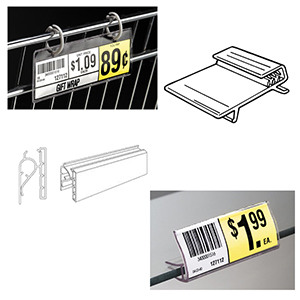 This gives you variety in how you want to show your price tags. Order before 4pm PST and you will receive same day shipping from American Retail Supply.